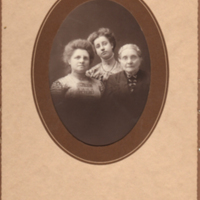 A sepia-colored, formal photo of three women: Mrs. C. D. Holmes, Edna Denniston, and Mrs. Dinsmore. Located on Nason Street in the alley behind where the banks are now located. 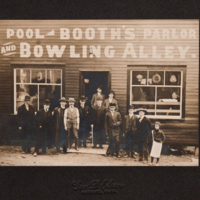 Jack Booth, in straw hat, was the owner. 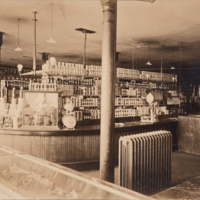 Later owned by George "Cubie" Lynch and then "Tutto" Graceffa who moved it to Main Street. 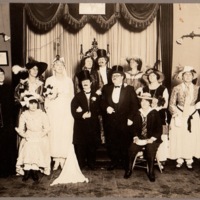 A photo of the Dramatic Club, date unknown. 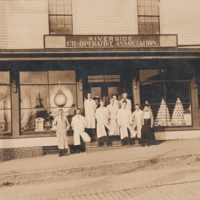 The Riverside Co-operative was located in the current Knights of Columbus building on the corner of Summer and Nason Streets.